Welcome to Eldeco Live by the Greens where life is a rejuvenating experience with each passing day. As the name suggests, the development is planned to provide the benefits of living in a clean and green environment, breathing the fresh air and then living a healthy life. One of the main highlights of the development is the architecture with a standard and unique design to offer healthy livable homes to the residents. Surrounding by greenery and opens spaces, the development offers grandiose apartments in 2 and 3 BHK configurations. The precious planning and thoughtfully designed features of Live Greens set it apart from others and lets you enjoy the beauty of nature. All the major amenities at the complex are planned as per individual needs and requirements. Eldeco Live Greens project is planned over a pristine land area of 20 acres on a four-side open plot. The apartments are designed so brilliantly to ensure proper cross-ventilation and natural sunlight to spread throughout in all corners along with the optimum space utilization. Adorned with premium fittings and fixtures, the apartments are designed keeping your class and luxury in mind. The landscaped views of the green surrounding are simply amazing that you can enjoy the balconies and large windows. This is a high-rise development planned that has 17-18 towers in total in the beautiful G+22 structures bringing a beautiful ambiance. There are wide balconies attached to each room in the apartment ensuring the panoramic views of the surrounding areas and lush greeneries. Location is another unique selling point of this luxurious development attracting the homebuyers and investors to invest in this property. Planned in Sector 150, the greenest sector of the region, you will enjoy a healthy life here. The social infrastructure at this location is well-developed and makes the life of residents comfortable. The location is well-connected to all the major landmarks in and around the city. Everything is conveniently available at your doorstep from the reputed schools to shopping malls, convenience stores to banks and more. The project is close to the upcoming FNG expressway ensuring the superb connectivity to NCR. Upcoming metro connectivity to all nearby location also ensures seamless connectivity to everywhere in NCR and giving reason to homebuyers to invest here. Noida Authority is also putting efforts to develop this location and making it the best investment option for good future returns. 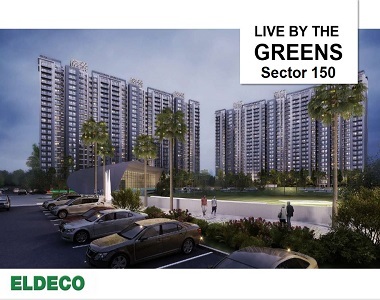 The entrance of the Eldeco Live by the Greens Noida is amazing and makes everyone go crazy with its designs. Some of the luxurious amenities include a musical fountain, sauna and steam and more. Apart from this, there is a grand clubhouse allows the residents to socialize with other residents. There is a swimming pool to have a cool dip in summers on a hot day. There is a dedicated area for smaller kids’ for seating with their guardians. There are several hangs out areas in the complex to sit and socialize with other residents. Considering all these Eldeco Live Greens highlights will help you to make a decision to invest here. The apartments at Eldeco Live Greens Sector 150 are reasonably priced along with easy payment options and home loan facilities. These beautiful homes have everything ensuring a healthy and happy lifestyle. What more you want? Have a look at this property and make a wise decision to invest here.